By the installation of the FILCOTEN pro channel body, with massive edges made of galvanized steel or stainless steel, loads up to class E 600 kN are possible - and with a slight component weight. Mesh grates or cast iron grates are available with quick locking system. Additionally, a vandalism locking device can be used. 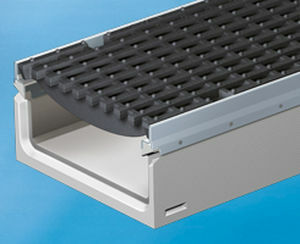 The gratings in FILCOTEN tec and pro are fixed by using an innovative clip system in the channel body. An additional anchoring prevents the removal of the grates (anti-vandalism locking device! ).